Altered gait patterns follow ing anterior cruciate ligament reconstruction (ACLR) may be associated with long-term impairments and post-traumatic osteoarthritis. This systematic review and meta-analysis compared lower limb kinematics and kinetics of the ACL reconstructed knee with (1) the contralateral limb and (2) healthy age-matched participants during walking, stair climbing, and running. The secondary aim was to describe the differences over time following ACLR for these biomechanical variables. Database searches were conducted from inception to July 2014 and updated in August 2015 for studies exploring peak knee angles and moments following ACLR during walking, stair negotiation, and running. Risk of bias was assessed with a modified Downs and Black quality index for all included studies, and meta-analyses were performed. Forest plots were explored qualitatively for recovery of gait variables over time after surgery. A total of 40 studies were included in the review; 26 of these were rated as low risk and 14 as high risk of bias. The meta-analysis included 27 studies. Strong to moderate evidence indicated no significant difference in peak flexion angles between ACLR and control groups during walking and stair ascent. Strong evidence was found for lower peak flexion moments in participants with ACLR compared with control groups and contralateral limb during walking and stair activities. Strong to moderate evidence was found for lower peak adduction moment in ACLR participants for the injured compared with the contralateral limbs during walking and stair descent. The qualitative assessment for recovery over time indicated a pattern towards restoration of peak knee flexion angle with increasing time from post-surgery. Peak knee adduction moments were lower within the first year following surgery and higher than controls during later phases (5 years). Joint kinematics are restored, on average, 6 years following reconstruction, while knee external flexion moments remain lower than controls. Knee adduction moments are lower during early phases following reconstruction, but are higher than controls, on average, 5 years post-surgery. Findings indicate that knee function is not fully restored following reconstruction, and long-term maintenance programs may be needed. The online version of this article (doi: 10.1007/s40279-016-0510-4) contains supplementary material, which is available to authorized users. All authors contributed significantly to the review. Gisela Sole was responsible for the conception of this review; Mandeep Kaur conducted the entire review, with Gisela Sole and Daniel Cury Ribeiro as second and third reviewers; Jean-Claude Theis and Kate Webster provided advice throughout the review. All authors were involved with the final manuscript. No sources of funding were used to assist in the preparation of this article. Mandeep Kaur, Daniel Cury Ribeiro, Jean-Claude Theis, Kate Webster, and Gisela Sole declare that they have no conflicts of interest relevant to the content of this review. Hart HF, Culvenor AG, Collins NJ, et al. 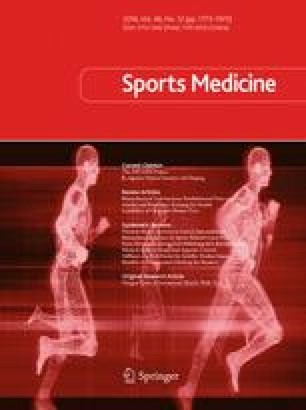 Knee kinematics and joint moments during gait following anterior cruciate ligament reconstruction: a systematic review and meta-analysis. Br J Sports Med. 2015. doi: 10.1136/bjsports-2015-094797. EMathZone, CV. Reference for grand mean: EMathZone, Combined variance. Available from: http://www.emathzone.com/tutorials/basic-statistics/combined-variance.html. Accessed 7 Oct 2014. Czamara A, Markowska I, Królikowska A, et al. Kinematics of rotation in joints of the lower limbs and pelvis during gait: early results—SB ACLR approach versus DB ACLR approach. Biomed Res Int. 2015. doi: 10.1155/2015/707168.